Being a historic property doesn’t mean you need to show your age. Think of us as the hotel industry’s Jennifer Aniston. One of the first projects the team conquered was the tile work on the indoor pool. The pool was drained, and the old tiles removed. The pool was then painted, and the new tiles installed. Once completed, the pool was refilled, the water warmed, and was once again open for our guests’ enjoyment. Learn more about our resort amenities. Along with the pool, several of our meeting spaces received the royal treatment as well. In the Delaware and Waring rooms, the wallpaper and carpeting were removed. In their place went a coat of soft colored paint, and beautiful dark hardwood flooring was laid. A deep cleaning and new drapery completed these rooms, which are the perfect space for small meetings and wedding receptions. Our Worthington Ballroom also received a fresh coat of paint and new flooring. A darker stain went on the grotto, and new light fixtures completely transformed this room. See all of the meeting and event space options at The Shawnee Inn and Golf Resort. Last but certainly not least, the one thing all our guests wanted to see was updated guest rooms. We have renovated every room on the third floor of The Main Inn and several rooms on the second floor. 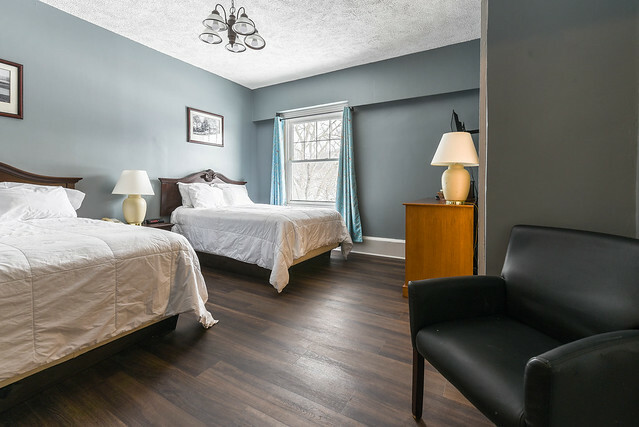 Our newly renovated guest rooms will feature beautiful hardwood floors and relaxing, country-inspired, paint on the walls. New drapery and deep cleanings will complete these guest rooms. Our Delaware Lodge, which is separate from The Main Inn and contains 12 guest rooms, has been gutted and is also receiving some much-needed updates similar to The Main Inn. We believe our guests will enjoy these changes just as much as the owners, management, and staff do! Be sure to book your stay in one of our newly renovated rooms today!